Barnesville students are JOYFUL learners who EXPLORE how subjects relate to one another, making CONNECTIONS that spark inquiry and deepen understanding. 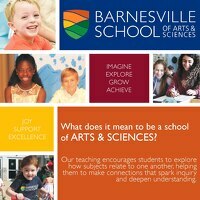 Barnesville School of Arts & Sciences offers a joyful and challenging academic program for preschool through eighth grade students that includes hands-on and experiential learning in and outside the classroom, cross-curricular and collaborative teaching, character education, and extracurricular opportunities. Small class sizes enable teachers to work closely with each student to ensure he or she is fully engaged and challenged. Graduates leave well-prepared for success in high school and beyond. Students attend independent, parochial, magnet, and public schools ready to take on a full range of academic endeavors as a result of the public speaking experience, analytical skills, and maturity they have developed at Barnesville. We aim to build a solid learning foundation for each student—a broad base of knowledge, skills, and values that prepares them for the next stage of their education. Just as important, we nurture their joy for learning so they are not only prepared, but excited about their future opportunities. Barnesville's mission and culture of joy, support, and excellence frames a learning environment that promotes imagination, exploration, growth, and achievement.